The process of earning the Certified Public Accountant (CPA) license involves passing the CPA Exam. The CPA Exam has 4 different sections, and one of them is Business Environment and Concepts (BEC). To pass BEC CPA Exam, you must know the content, pass rates, questions, format, difficulty, structure, timing, and more, and you can get all of that information here. Use it to beat BEC! As we learn in the BEC CPA Exam Blueprints, the BEC CPA Exam section covers the knowledge of the general business environment and business concepts that candidates must know in order to understand the underlying business reasons for and accounting implications of business transactions. BEC also assesses candidates for the skills needed to apply that knowledge in performing financial statement audit and attestation engagements and other functions normally performed by CPAs that affect the public interest. Now, many candidates find the CPA BEC exam to be the easiest (or rather, least difficult) of the 4 exam sections. With my background in economics, I also found BEC to be a less stressful CPA Exam section. However, if you are fresh out of college or are unfamiliar with real business operations, you cannot afford to underestimate BEC. A survey of BEC’s content and questions to confirm the truth in this statement. Again, BEC focuses on business. In 5 content areas, BEC addresses audit, attest, accounting, and review services, financial reporting, tax preparation, and other professional responsibilities of CPAs. This table outlines the CPA BEC exam content for you. At this moment, the BEC CPA Exam pass rates are, quite simply, the best of the best. BEC achieved some record-breaking pass rates in 2018 and has basically dominated the pass rate charts for the last several years. BEC rose to the top of the CPA Exam pass rates in 2011 by coming back from behind. From 2006-2011, BEC lived at the bottom of the pack with the lowest pass rates. Then, after the CPA Exam changed in 2011, it pulled off an unpredictable betrayal and supplanted all the other sections. Since then, BEC has never looked back but retained its top-dog position for 8 years straight. So, what enabled BEC to shake its underdog status and then subsequently rule the roost for so long? Well, of all the CPA Exam sections, BEC is the least technical. What’s more, the majority of BEC tests candidates for the second lowest skill level, Application. And, BEC has only included task-based simulations (TBSs) for about a year and a half now, having received them for the first time in April 2017. But BEC still only has half as many TBSs as the other exam sections (4 compared to AUD, FAR, and REG’s 8), so BEC is still half as difficulty in this regard. BEC also comes away with fewer multiple-choice questions (MCQs) than any other exam section, having just 62. 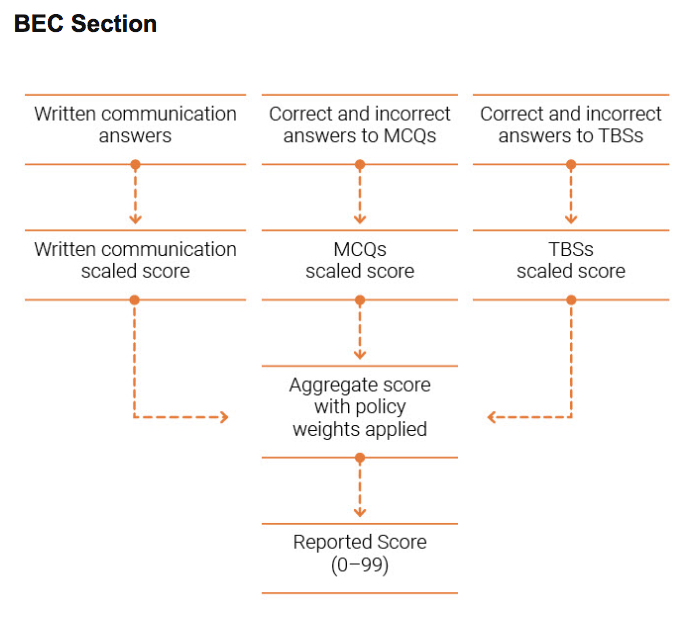 And finally, the reason BEC features less of the other types of exam questions is that BEC is the only section to boast written communications (WCs). BEC has 3 WCs, and these questions comprise 15% of your score. WCs aren’t so bad as MCQs and TBSs because their purpose is to prove that you can write an organized, well-developed business document containing clearly expressed correct information. So, all of these factors work together to make BEC the least challenging CPA Exam section and consequently the holder of the highest CPA Exam pass rates. The BEC CPA Exam section stands out from the other 3 CPA Exam sections by having one additional question type. While the other 3 sections only have 2 types of questions, BEC has 3. The AUD, FAR, and REG CPA Exam sections utilize just 2 types of questions: multiple-choice questions (MCQs) and task-based simulations (TBSs). However, BEC uses both of these question types as well as a third question type: written communications (WCs). On the CPA BEC exam, the MCQs contribute to 50% of your total score. The TBSs account for another 35%, and the WCs add the remaining 15%. Task-based simulations are the CPA Exam’s version of condensed case studies. TBSs present you with real work-related situations and require you to apply your knowledge and skills to resolve those situations. For example, to finish a TBS, you may need to use information found either in the question or in the exhibits provided to perform a calculation, fill in a series of blanks, or revise a document. The BEC CPA Exam sections feature one particularly important type of TBS: the Document Review Simulation (DRS). The DRS expects you to look over various resources in the process of analyzing a document. Written communications are the only CPA Exam questions that require you to write out your response. To answer a WC, you must read a scenario and then follow the instructions to write the appropriate document relating to the scenario and give that document the proper focus. Your written response should include the correct information and be clear, complete, and professional. The AICPA has completely computerized every section of the CPA Exam. Additionally, each section contains 5 testlets presenting different question types. BEC has 2 testlets of 62 total MCQs, 2 testlets of 4 total TBSs, and 1 testlet of 3 WCs. Each CPA Exam section’s total number of questions features both operational and pretest questions. However, only the operational questions affect your CPA Exam score. The pretest questions do not because the AICPA includes them on the exam to collect candidate performance data instead. The AICPA uses this information to decide whether to use the pretest questions as operational questions on future exam iterations. Yet, while you may assign operational and pretest questions a different value, you can’t give them a different amount of attention. I say this because the operational and pretest questions are indistinguishable on each exam section. So, you really must answer all the CPA Exam questions you receive to the best of your ability. However, the presence of pretest questions shouldn’t discourage you. Rather, pretest questions should encourage you due to the fact that some of the most challenging or surprising questions you see on BEC may be pretest questions. So, if you see such a question, you shouldn’t worry about it. You should simply answer it as well as you can and move on with the hope that it was probably a pretest question and therefore will not influence your score. The AICPA makes the goal of the CPA Exam explicit: to verify that candidates have the knowledge and skills needed to a newly-licensed CPA and to represent the certification well. The AICPA ensures that the CPA Exam can fulfill this purpose by defining the difficulty of each exam section with 4 different levels of skill. The BEC CPA Exam section tests candidates at 3 of these skill levels. According to the chart, BEC places the most weight on the Application skill level and distributes this weight across all 5 content areas. Therefore, you need to have more than just a passing familiarity with all of BEC’s content. But, at the same time, you don’t need to know the BEC material at the deepest level of knowledge. BEC’s lack of depth makes sense because it consists mostly of MCQs, even though it has the lowest number of MCQs out of all the exam sections. Furthermore, the WCs only assess you for the Application level of knowledge, and these make up 15% of your score. So, you’re left with just 4 TBSs to challenge you at a higher level of knowledge than Application. Consequently, many candidates don’t find BEC to be as difficult as some of the other exam sections. Because BEC has MCQs like the other CPA Exam sections, it follows the exam-standard presentation of MCQ testlets, which is a multistage adaptive delivery model. This big term may be ambiguous, but it just means that your performance in the first MCQ testlet determines the difficulty level of the second MCQ testlet you receive. As this graphic illustrates, you’ll always receive a moderately difficulty (“medium”) MCQ testlet first for any CPA Exam section. Then, if you perform well on this testlet, you’ll receive a slightly more difficult (“difficult”) MCQ testlet second. If you don’t perform very well on the medium testlet, the exam will serve you another medium MCQ testlet. The CPA Exam uses the average difficulty of the MCQs within a testlet to determine that testlet’s difficulty level. The MCQ difficulty level exists on a numeric scale; it is not binary. Furthermore, on the CPA Exam, you earn more points for answering a difficult question correctly than for answering an easier question correctly. Consequently, the exam won’t penalize you for receiving a more difficult MCQ testlet or let you benefit from getting 2 medium MCQ testlets. The CPA Exam follows a different system to establish TBS and WC testlet difficulty. Instead of allowing your performance to influence the difficulty, the CPA Exam predetermines the difficulty of your TBS and WC testlets. But thankfully, you can earn partial credit for your work on the TBSs and WCs you receive. Whether you sit for BEC or any other CPA Exam section, you will have the same amount of time to finish each exam section: 4 hours (240 minutes). Additionally, you’ll need to go through some additional screens at the beginning and end of the exam, and you’ll receive 15 minutes to do so. After the third testlet (first TBS testlet), you can also take advantage of a standardized 15-minute break. This optional break is the only one you can take that will pause the exam timer. Any other break you go on won’t stop the timer. As you can see in this illustration, you are allowed to take an optional break after each testlet. But as mentioned, these breaks don’t pause the exam timer, so you’ll be taking them at your own risk. Want to know the secret of having the best chance to pass BEC? Time management. That’s right: You can only ensure that you answer every exam question and maximize your exam score by practicing time management. For this reason, you should definitely develop, practice, and apply your BEC time management system before you take this exam section. Or, you can just give yourself 18 minutes for each TBS. Assigning 18 minutes to each TBS would leave you with 106 minutes for the 3 WCs, so you’d have about 35 minutes for each of those. On the other hand, if you give yourself 1 ¼ minutes for each BEC MCQ, you’ll take as long as 78 minutes to complete the first 2 exam testlets. You may want to consider doing this in light of the fact that your second MCQ testlet could be harder than your first and therefore require more time to finish. With the 162 minutes you have left, you could use 87 minutes for the 2 TBS testlets. This amount of time breaks down to a little less than 22 minutes per TBS. Finally, with your remaining 75 minutes, you could give yourself 25 minutes for each WC. No matter which section you’re taking, you can only take it during the 4 annual CPA Exam testing windows. Furthermore, you must pass all CPA Exam 4 sections within a rolling period of 18 months. Your 18 months begin as soon as you pass your first exam section. So, conveniently, you have another year and a half to pass the other 3 sections. If you fail to pass the remaining exam sections within this time, then your credit for your first passed section will expire. What’s more, the start date of your 18-month window will move back to the day of your earliest section pass. At this point, you’ll have to pass the section you already passed again as well as the sections you haven’t yet passed within the new 18-month timeframe. And until you accomplish this, your 18-month window will continue to restart, and you’ll continue to lose credit for your earliest passed section. Having weighed the pros and cons of placing each exam section at the beginning of your CPA Exam schedule, I’ve determined that starting with the most difficult section is the wisest way to go. And currently, FAR, not BEC, is the most difficult CPA Exam section. FAR is the most difficult because it covers the most content and therefore requires the longest amount of study time. So, if you start your exam journey by passing FAR, then you won’t have to include all of that extra study time in your 18-month window. Another benefit of starting with FAR is that its content overlaps with that of AUD and BEC. Therefore, the material of AUD and BEC will look familiar when you come to it, and you won’t have to study for these 2 sections as long or as hard. So, if I don’t recommend putting BEC first on your schedule, where do I think it should go? Honestly, I would leave BEC for last. The content relationship between AUD and FAR lends itself to placing them back-to-back. Then, because REG is fairly challenging on its own, addresses new material, and can take longer to study for, I’d drop REG in the third-place spot. Though BEC also aligns with FAR and AUD, finishing the race with BEC isn’t a bad idea because studying for it shouldn’t take too long and will feel like going downhill. With the WCs accounting for 15% of your score, only 4 TBSs making an appearance, and the presence of very high BEC pass rates, you’re more likely to get that last pass you need if you end with BEC. Using my own personal experience, the feedback from my readers, and the suggestions of CPA review course providers, I estimate that you should prepare to spend somewhere between 60-80 hours studying for BEC. Remember, if you’ve already passed FAR, studying for BEC shouldn’t take you as long. But, to give yourself a better idea of how long studying for BEC will take you, you can survey BEC’s content using the BEC CPA Exam Blueprints. The Blueprints reveal the content areas, groups, and topics you’ll see on BEC. If you want to finish BEC in a flash, you should push yourself to study for at least 20 hours a week. Then you’ll finish your review in 3-4 weeks. Not so pressed for time in your 18-month window? Then you can slow your BEC studies down a bit by putting in 15 hours a week and concluding your review in 4-5 weeks. If you’re lacking time in the rest of your life for BEC studying, then you can keep it to just 10 hours a week and wrap things up in 6-8 weeks. My best advice for making sure you master the BEC material? Tackle the different topics one by one. BEC is a basket of miscellaneous business, economics, and financial concepts. These topics don’t relate to each other, so some candidates struggle to retain the information. To prevent yourself from succumbing to this same struggle, take on each topic one at a time. Corporate governance is an important topic with connections to other CPA Exam sections such as AUD. To do well with this topic, pay special attention to the role of the Board of Directors and the Audit Committee. This topic isn’t too difficult, but questions about it can be tricky, so you need to know your stuff when it comes to corporate governance. If you’ve taken an economics class, you should find the questions on the BEC CPA Exam to be pretty straightforward, as they should only cover elementary micro and macroeconomics. Yet, even if you don’t have a lot of prior economics knowledge, the concepts still shouldn’t be too difficult. In fact, you can usually use common sense to guesstimate. Your strategy for introducing yourself to the economics on the BEC exam should be to go through the textbook or video lectures fairly quickly and then focus your time on the practice questions. You may be surprised by how many wrong answers you may get in the beginning, but that’s just how tricky the CPA Exam can be. Hence, the low pass rates. But don’t get discouraged. Instead, know that your performance will improve once you get used to the question format. My experience in the strategic planning department made this topic easier for me, but I understand that people who haven’t done much financial modeling may see it as very complex. So, the trick for taming financial management is to really understand how the calculation works. Also, don’t memorize anything more than the basic formula. If you can’t figure the basic formula out, contact the accounting professors/experts to which your review course gives you access. These professionals should be able to offer an explanation that sets the record straight for you. IT is such a huge topic that your CPA review course can’t really get to it all. However, IT is very important in real life, as the accounting industry continues to increase the involvement of IT in its operations. Already, accountants post all journal entries into the system that generates everything from monthly statements to management reports and more. So, due to IT’s ever-rising significance, each accountant must learn how to maintain the integrity and security of this system. While IT is not always the most interesting thing to study (I know, I’ve been there, and the reading took forever…), the good news is that the BEC CPA Exam section’s coverage of IT involves mostly facts and terminology. Consequently, these questions don’t have a reputation for being very trying. As a result, most candidates do well with this material after reading the book or watching the video lectures once and then focusing their time on the practice questions. You may have learned about cost accounting in college, but if you didn’t, then this BEC topic may be challenging for you. In fact, you may need extra help to get a handle on cost accounting, so don’t be afraid to call on the instructors who really understand the concepts behind it. I must confess: I think I still don’t really get cost accounting, but at the time, I understood it well enough to pass the BEC exam. If you really can’t figure cost accounting out, work extra hard on understanding the rest of the BEC content, so you can still pass. Along with taking the above steps to get a solid grasp on the biggest BEC topics, you should follow these additional CPA BEC study tips to ensure exam success. 1. Do NOT underestimate BEC. By bracing themselves for the worst, some candidates pass the other 3 exam sections on the first try. But then, they don’t put as much effort into BEC and get stuck on it for quite some time. It is easier for most candidates but not all candidates. So, don’t assume that passing BEC won’t take some effort still. 2. Strengthen your weak areas. To pass BEC, you must master every content area no matter how much you hate it. So, whether it be cost accounting or financial modeling, commit to learning the content you don’t enjoy or that you struggle with as much as the content you prefer to study. To strengthen your weak areas, you’ll need to watch all the video lectures and read all of the chapters about that content. You must also work through all of the practice questions that ask about those topics. Basically, you can’t skimp on studying when it comes to your weak areas, or you won’t score as well on BEC as you want. If you find BEC to be fairly difficult when everyone else you know thought it was a breeze, don’t panic. BEC has had its fair share of pretty low passing rates, so it’s not meant to be a walk in the park. BEC’s content is a bit more varied than the content of some of the other exam sections, so you may find an area or 2 in which understanding doesn’t come naturally for you. And that really is okay. As long as you stick with it and give the hard parts the attention they need to become easy, you can pass. 4. Prepare for the written communications. Writing a business memo might not seem as bad as working through a DRS, but you still can’t wing your responses to the WCs. Instead, you need to practice answering them, so you can ensure that you have a plan. Once you’ve read the question, make note of each requirement. Then, create a quick little outline that addresses each requirement. Your main goal is to stay on topic and avoid providing illegal advice. Your second goal is to provide ample evidence for all of your claims. So, fill the outline in with all the important information, then add the final components and finish the formatting. Once you’ve completed your draft, edit it for grammar, punctuation, word choice, and relevance. Also, confirm that you’ve said everything you could about the topic. If something else comes to mind, add it. Unless you practice the process of crafting a well-written and well-thought-out WC, you’ll miss out on an easy 15% of your BEC score. BEC really isn’t as bad as some of the other CPA Exam sections, but you still need to put time and effort into passing it. Therefore, you must prepare for BEC by using the right CPA review course. You can find the best CPA review course for you in my comparison of the most popular options. Then, you can use my great CPA review course discounts to save big on your BEC CPA Exam prep. If you haven’t already, you can also learn all about the benefits of becoming a CPA, the details of the CPA process, the best way to ensure that you pass the CPA Exam, and more in my free e-course. Get answers to your questions about my free CPA Exam guide now or sign up below to begin your CPA journey today! Thanks so much for passing on your expertise and knowledge of what to expect in the BEC section of the exam. Helpful information! I’m using yaegar and my test is tomorrow for BEC. Am I screwed?! I sat for BEC today, I am pretty confident that I did well, let’s see when grades show up, this is my first time and I used Wiley book and Bisk software, Wiley was overwhelming and unnecessary, none of the two pragraph problems were on the test and looking at time allotted I don’t know how they can test for problems requiring long calculations, stick to basic and understanding the subject matter and you will do fine in BEC, on to next one. Can you tell me if 2011 BEC will include the topics of business structures and cost management in the exam? It seems like corporate governance and operations management have been added to the exam, but I’m not sure what topics have been removed. Thank you. Business Structures have been removed from the 2011.
with the upcoming changes in CPA exam in 2017 spring, I’m planning to take BEC & REG first. After reviewing a CPA review course comparison on your website, I’ve purchased Roger CPA review and have completed 70% in 3 weeks by putting 3 hours daily and 5 at weekend. They have a good bank of IPQs but do you recommend to buy another CPA test bank for more practice. They suggest it’s not needed. But, as I said I’m planning to watch 100% lectures including class Questions & majority of their practice questions by end of this month leaving me extra 40 days to do cram course + revise the material & practice more to appear my first exam BEC on 8-Sep.
Can you please advise if it’s worth investing in extra CPA test bank or IPQs provided in review course are enough for practice? Nirav, that’s great progress! My readers said Roger’s practice questions are too easy, but that is before they upgrade their IPQs. So not sure if this is the case. Because of this earlier observation though I would be nice to get a supplement if you don’t mind the extra cost. I think it’s worth it, since you have the time. Either Gleim test prep or Exammatrix will be good choice in my opinion because they should be quite different from Roger’s sets. Let me know how it goes! Thanks for the reply, Stephanie. I’ll surely check that out. Also, I’m not sure about pre-upgrade, but post upgrade IPQs are not easy for sure at least I can tell because they’re plain adaptation from previous CPA exams so it’s definitely tricky. I’m also PMP certified & I can kind of co-relate it with CPA from the exam Qs stand point. Many a times, the concepts are easy to understand but they ask you in a different/tricky way to incline you to make mistake. I received the score of my BEC section today which is 70. How can I retrieve the break up section- wise to review my performance? I started prepping for my 1st CPA exam BEC from July 1st with Roger CPA Review & completed all video lectures, read book, practiced IPQs by July 31st. I started Roger CRAM course on Aug 1st which I completed by Aug 20th with the repetition of practice questions. By Aug end, I also took 3 simulation exam tests from Roger which the score of 90, 85, 84 respectively. For more practice & to avoid repeat questions, per your suggestion, I bought yet another test bank from Exam matrix to practice another 600 MCQs before I appear for my BEC exam on Sep 8th. Barring few overlapping questions between Roger & Exam matrix, I indeed found the level of MCQs from Exam matrix to be higher which shows from the fact that I took 2 tests from Exammatrix & I scored 73 the highest. In the final exam, due to anxiety of being my 1st CPA exam + some of initial intricate questions (+ probably psychological factor of unable to score 75+ in recent Exam matrix software), I was off in my time management from 1st Testlet by 20 min, which I recouped to some extent in 2 & 3rd Testlets leaving only 33 minutes for me to complete my 3 WCs. Specially the last one I completed in 8 minutes! Considering above, beyond time management (which is definitely one thing I’ll be working on) what additional piece of advice do you offer for me to prepare, when to re-take BEC again, what area should I focus more, did you find any discrepancy in my prep method knowing above? After my BEC exam, I also ordered your book ‘how to pass CPA exam’ & completed half of it by now. I already started preparing for my REG with a hope of taking exam by Dec 10th but now Plan B has kicked in. I intend to pass both BEC & REG by next spring before the new format kicks in. Never been in the situation before of having mixed feelings of despite scoring distinction 70 but still on receiving end.